Trump's America, non-stop flights, and distressed students helped decide where the Halo co-developer opened its new office. Certain Affinity is going to start making its own AAA games. We've heard that from the Austin-based co-development studio before (more than six years ago, in fact), but this time it's less of an aspirational goal and more of a work-in-progress. Two years ago, the studio began shifting its business partially away from the support work it performed on franchises like Halo, Call of Duty, and World of Tanks to pursue its own games. It took on investment from Chinese poultry/gaming firm Leyou, embarked in earnest upon its own original titles, and staffed up from 120 full-timers to the current headcount of around 170. That number looks ready to balloon further, as Certain Affinity today announced the next big step in its shift to original game development, a new studio location in Toronto, Ontario. Speaking with GamesIndustry.biz in Toronto last week, Certain Affinity president and founder Max Hoberman said he hopes to hire aggressively for the new studio, going from zero employees at the time of our discussion to ideally 50 or 60 by mid-2019, with tentative plans to grow it by an extra 100 or so in the following couple years. "About a year ago, I hit upon this idea that we should contemplate opening up a second location, and we should do it in a way that is complementary to us, complementary to what we're doing in Austin, to go somewhere that has some advantages and fills in some weaknesses," Hoberman said. "I wanted to go somewhere we could recruit international employees much more easily. It's very, very difficult in the States"
As for what weaknesses a game development hub like Austin might have, the biggest one was, perhaps surprisingly, talent. "I wanted to go somewhere we could recruit international employees much more easily," Hoberman said. "It's very, very difficult in the States. And there are lots of reasons. That was the trigger to start thinking about it. If we are going to consider a second location, let's try to find somewhere it's much easier for us to tap into a worldwide work force, because it's exceptionally difficult in the US right now." When asked if the Trump administration's policies and handling of immigration and naturalization have had anything to do with that difficulty, Hoberman said some of the studio's employees had issues on those fronts, but the company has so little experience in that area it's hard to say if the situation would have been any better under previous administrations. The more apparent problem he has seen is less about getting foreign talent through the red tape as it is getting them interested in an American studio in the first place. "From a psychological standpoint, it's gotten tougher because international people looking at the US are shying away," Hoberman said. "They're much more hesitant. Let me put it that way." 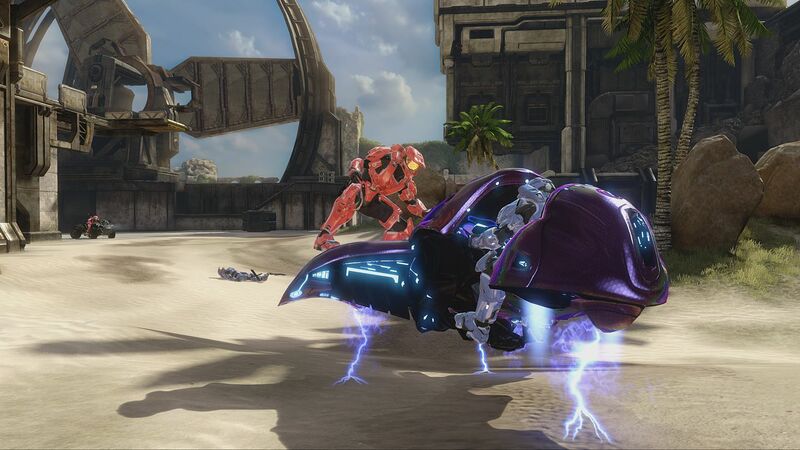 Certain Affinity handled the Halo 2 revamp in 2014's Halo: The Master Chief Collection. Hoberman was multiplayer/UI lead on the 2004 original. So Toronto provides an international beachhead for the studio to access talent from the rest of the world, but Hoberman said the local scene could be a boon for Certain Affinity as well. While there's no shortage of game development in the area, it's much more weighted toward indie and mobile games than the AAA shooters Certain Affinity has worked on over the years, something Hoberman realized during a recent visit to one of the area's schools. "I was talking to some of the students and asking by a show of hands, how many of you when you graduate want to make mobile games? In a room of 30 people, I got three people raising their hands," Hoberman said. "Now how many of you want to make core games? Everyone's hand shot up." Then he asked if the students felt they had many options to make those kinds of games locally. "The answer I got universally was 'No, if we want to make core games, unless we go to Ubisoft we have to leave Toronto,'" Hoberman said. "And I could tell that really bothered people. A lot of people were really distressed by that." "That's actually what got me up here to check out the city. That's what pushed me over the edge." Another key reason for the Toronto selection stemmed from Hoberman's insistence that the Toronto offices operate 100% as an extension of the Austin studio. "They're not different," Hoberman said. "They're not treated separately. They may be in a different location, but they really are just an extension of what we're doing. That's the only way I can see it actually working. I've seen it go wrong too many times." He expects to have TV screens with cameras and open mics in both offices all day long to facilitate the communication and interaction such a set-up will require. Of course, that doesn't work as well if the studios speak different languages, or have significantly different working hours. Hoberman also wanted the new studio to be easily accessible from Austin, and pointed to the recent addition of non-stop flights between Austin and Toronto as a key differentiator when it came time to select the new studio's location. "That's actually what got me up here to check out the city," Hoberman said. "That's what pushed me over the edge. It's a big deal when you think about it. If we're going to make this work, I need my people to be willing to go up to Toronto at a moment's notice, and vice-versa. We need to be able to quickly and frequently bring employees from Toronto down to Austin so everyone feels integrated, and not too expensively, of course." Hoberman offered his kudos for the non-stop not to the airlines, but to the cities of Toronto and Austin, saying a contact at the Austin Chamber of Commerce told him the cities had been involved in the route being added. And while Hoberman didn't offer it as a reason for Certain Affinity's decision to go with Toronto, when asked he acknowledged that provincial tax credits played a part in it, saying it was "in the top five." "I was very aware, having been at Bungie for a long time, that it had really taken Bungie 10 years to make Halo," Hoberman said. "Bungie in year five could not have made Halo. No way. There were a lot of people who would leave Bungie for various reasons and then go out and try to get $100 million to make a Halo killer, and I just thought it was ridiculous. You can't just do that. "In my mind, you have to build a team, a foundation of technology, shared experience, process, all these different things. You need that strong foundation before you're ready to jump. And there certainly are exceptions to the rule, companies that had wild success right off the bat, but we're the turtle in the race. Sometimes hares get to the finish line ahead of us, but more often than not there are hares that pass out and die before they get to the finish line of huge success." "When we hit that 10-year mark, I felt like I'd made a commitment to my staff that 10 years was the point where we'd start to do this and take more risks," Hoberman said. "And I felt like if I didn't make that transition, I'd be letting down all my employees." Co-developer of Halo 4, Call of Duty: Black Ops excited to "create an ambitious and exciting new game together"
Max Hoberman is utterly correct.